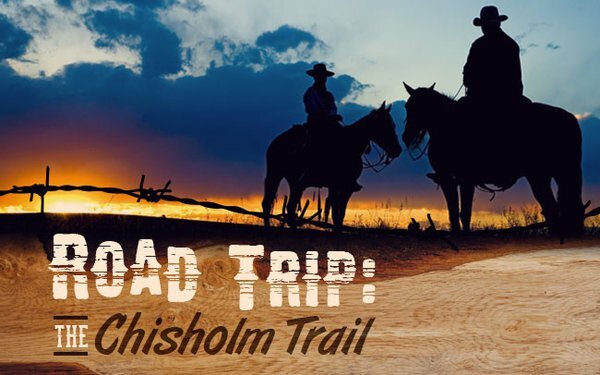 Located along what is now U.S. 81, the Chisholm Trail is packed with beautiful landscapes and a wildly exciting history. Located along what is now U.S. 81, the Chisholm Trail is packed with beautiful landscapes and a wildly exciting history. This iconic cattle trail, carved into the red Oklahoma dirt, once provided a pass for south Texas ranchers to distribute beef to northern states. Today, the route winds through charming small towns boasting big landmarks and historical centers. 2017 marks the 150th anniversary of the famed route, and Oklahoma has tons of special events in store. Read on for must-see events and attractions along the way. Between 1867 and 1877, more than three million head of cattle passed along the Chisholm Trail in Oklahoma. One of the most famed strips of land in the American West was created by trader Jesse Chisholm, a character you’ll meet at the Chisholm Trail Heritage Center in Duncan. Here, you’ll be introduced to an assortment of historical figures who helped carve out this famous route. Visitors to the center are greeted by life-size sculptures of cowboys driving longhorns along the trail. Step inside to find the trail drawn out on a path to give visitors a sense of the trail’s geography and the cultural impact it had on the region. Interactive exhibits let little cowpokes try their hand at tossing a lasso on a steer or riding a bucking bronco. Step into the multi-sensory theater to feel the splash of the herd through a creek and smell the coffee cooking over an open flame. Then, gather around the museum’s campfire to hear Jesse Chisholm himself impart the history of the trail. While in Duncan, one must-see stop includes the Trail Ruts at Monument Hill where you can spot visible remains of the famed Chisholm Trail etched by the hooves of cattle. Opt to explore the area on your own or sign up for a guided Chisholm Trail Tour to get the inside scoop on Duncan's historic markers. Continue on the trail to Marlow to find a piece of the route packed with outlaw legends. Imaginations run wild in this town, which was named for the Marlow brothers, a group falsely accused of rustling cattle on the Chisholm Trail. Their story was most famously portrayed in the film, “The Sons of Katie Elder,” starring John Wayne. Head to the Marlow Area Museum to see artifacts from the Marlow family including the contract signed by the members of the family handing over the rights for the film. The museum also houses the original tombstones of Marlow brothers Alfred, Boone and Lewellyn. At Marlow’s Redbud Park, a Western-themed playground called "The Hideout" adds to the outlaw experience. The playground gives young travelers the opportunity to play outlaw, while setting out on the half-mile walking trail gives visitors the chance to glimpse the rugged cattle route. Redbud Park encompasses 10 city blocks and is also home to Redbud Chapel, one of the first churches built in the area. Make a stop in Yukon to follow in the footsteps of cattle drivers who saw this pleasant piece of Oklahoma land as a great place to rest. Their stopping point is memorialized at the Chisholm Trail Watering Hole & Historic Marker. Located near the Freedom Trail Playground, it’s the ideal stop for young history buffs to enjoy a dinosaur dig in addition to on-site playground. Step into the multi-sensory theater to feel the splash of the herd through a creek and smell the coffee cooking over an open flame. Another Yukon stop that beckons travelers is the Express Clydesdales Ranch. Step into a beautiful Amish-built barn that’s been standing strong along the Chisholm Trail since 1936 and you’ll be greeted by impressive horses weighing almost a ton each and standing about six feet tall at the shoulder. The Yukon Historical Society has paired with the ranch to present the history of the Old West cattle drives through exhibits in the barn’s loft area and throughout the property. From the loft, gaze out over miles and miles of rolling Oklahoma farm land. Pay tribute at trailblazer Jesse Chisholm's Grave Site located outside of Geary. For the last 40 years of his life, the Cherokee trader, guide and peacemaker lived his life in Indian Territory and passed away near a well-known watering stop along old Chishom Trail called Left Hand Spring. Today, his grave is marked with a granite monument denoting his importance to the area. A visit to Kingfisher solidifies the impact the Chisholm Trail had on the community with a life-size statue of Jesse Chisholm standing right in the center of downtown. The iconic trailblazer is depicted on top of a horse, extending a peace pipe just as he might have done while traveling through Indian Territory to trade buffalo hides in Kansas. The Chisholm Trail Museum & Governor Seay Mansion in Kingfisher is packed with impressive exhibits that reveal the timeline of the trail beginning with Jesse Chisholm and ending with the land runs at the end of the century. Some of the museum displays feature a frontier village with a church, bank and log cabin that was once home to the mother of the Dalton Gang, one of the region’s most famous outlaw outfits. Fun photo op: Located 20 minutes north of Kingfisher, you'll find Bull Foot Park in Hennessey, which was once a re-supply stop on the Chisholm Trail and is now a park with a cattle drive sculpture garden. Wrap up your road trip in Enid to see how this famous route through Oklahoma forever changed the state and its settlers. Head to the Cherokee Strip Regional Heritage Center to see how the trail blazed by cattlemen later welcomed a boom with the Land Run of 1893 that settled Enid. The movement of cattle through the area laid the foundation for the farming and cattle industries that continue today. In addition to a one-of-a-kind museum packed with educational exhibits, the center is home to the Humphrey Heritage Village, a living history village that reveals every aspect of pioneer life. Go back in time as you stroll through a one-room schoolhouse, Enid’s first Episcopal church, a family home built in 1905 and the only remaining land office from the 1893 Land Run. While in Enid, take a jaunt over to Simpson’s Old Time Museum & Movie Studio for a fun and fascinating glimpse of Wild West history. An authentic trail scene complete with a campfire, chuck wagon cook and life-size bison will take you right back to the dusty trail days.